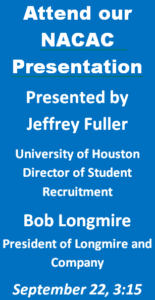 We just returned from Columbus where we teamed up with Jeff Fuller, University of Houston Director of Student Recruitment, to present the results of our nationally co-sponsored study, “The Relationship Dynamic,” to an enthusiastic crowd of enrollment professionals at the NACAC Conference. NACAC’16 drew thousands of participants and I suspect that most returned home feeling like our team; newly energized and proud to be part of the profession of college admissions. 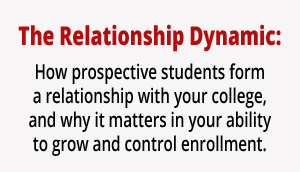 “The Relationship Dynamic” defines specific actions colleges can take to build stronger relationships with prospective students that will lead to enrollments and it was great to be able to share those with the 500+ admission professionals that attended our presentation. Often, the most constructive part of any presentation comes from the questions asked by the participants and we want to share some of the best Q&A’s to share with you. A: “If it’s possible to have conversations with each of your prospective students then use those to explore the issues that are relevant to them. I’m talking about asking a diverse and penetrating set of questions much deeper than “what do you want to study?” Once you’ve gained an understanding of the student’s motivations, interests and fears, the info must be recorded in a CRM or other data warehouse where you can pull it to drive future communications. If you are one of the many colleges who have enormous pools of prospective students making it impossible to have individual conversations, we advise you to ask for feedback and information from students with each and every communication. Make it a two-way instead of a one-way flow of information. Want to see the full “Relationship Dynamic” report? Click here for an instant download. There are communication techniques your staff can learn that will help them feel confident about reaching out to prospective students to ask the right questions. This is one of the core techniques we teach in the Interactive Counselor Training Workshops we hold on college campuses throughout the country. It is also a key component of YES, our Yield Enhancement Tool. Let me show you how we can help you. Please call or email me for more information. Continue the conversation on Twitter @LongmireCo. Be sure to Subscribe to Versions of Conversion today so you don’t miss any of this highly-valuable information. Let’s hear it for College Admission Road Warriors! All over the country, college reps are contacting high school counselors, hosting meet & greets with college-bound seniors, presenting at college fairs, pulling together promotional materials and visiting 100+ high schools in way too few days. For admission counselors, it is Travel Season and it can be stressful and relentless. But, is it productive? Here are a few Travel Season Tips that will help you differentiate your college or university, have meaningful interactions with prospective students and ensure a very rewarding travel season. That great pitch you have prepared? Put it away! Many counselors have a canned presentation at-the-ready that lists of all the super features their school has to offer? If you have one, set it aside. Features are only benefits when the person hearing them sees value in them. How do you know which special attributes of your institution will be meaningful to a student? You ask the right questions. When you are asking questions and getting acquainted with the student you are also doing the one thing that will truly distinguish your college from all others. Can you guess what that is? The answer is: Taking (and showing) a personal interest in the prospective student. If you are thinking that is too simple, or that most colleges do this already, two-thirds of prospective students will disagree with you. 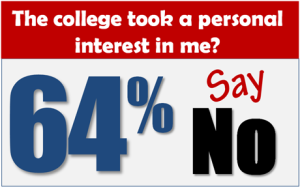 In truth, college-bound students say that the majority of the colleges they communicated with during the college shopping process never took a personal interest in them at any point in the recruiting process. In our nationally co-sponsored study, “The Excitement Factor,“ 12,000 college-bound students told us that the college’s personal interest in them, or lack of it, was influential in their college selection decision. And, as a practical matter, the more personal interest you take in a student the more you will find out about his or her unique combination of interests, preferences, desires, anxieties, and aspirations. With that greater understanding you will naturally communicate a unique value proposition. The student will perceive you as distinctive among their available choices. You will have reached the coveted state of differentiation. The best conversations start with these questions. Every admissions counselor has an arsenal of questions that they ask prospective students during the school high school visit. We suggest that you replace those with the type of questions that will begin the process of building relationships. These topics are great discussion-starters for group sessions, too. Picture your ideal college. Tell me about it. Is there anything that concerns you about college? Right now what college interests you the most? Why? Do you see anything getting in the way of going to college? Why are you most interested in biology/communications/whatever? How would you like me to communicate with you? May I text you? The best admissions representatives paint a picture of what the college experience will be like. And they do that in a way that is personalized to the student. The right questions will help you paint a compelling picture. In our most recent co-sponsored study, “The Relationship Dynamic,” college-bound students told us that they are most likely to build a relationship with an admission counselor who is knowledgeable and responsive. They most appreciate the counselor who knows the answers to every question about their school, campus, costs, loans, scholarships, etc… And, if they are asked a question that they don’t have an answer for, they promise to find out fast. A key member of your team: High school guidance counselors. Guidance counselors are crucial influencers for college-bound students and they can be one of your best assets. Unfortunately, they are often the most overworked and underappreciated educators on the team. In most high schools, the guidance counselors wear many hats and guiding seniors through the college search process is just one of the many goals they need to accomplish each day. Before you arrive on campus, learn all you can about the school you are visiting. You should be able to identify strengths that match up well to your college or university. The high school has an award winning band/art/science program? Perfect! Your college just happens to have one the best programs in that particular area in the state/region/country. Don’t just concentrate on the high school’s strong points, though. Make note of what is missing from the school’s offerings and fill that gap. Good counselors often know of students who have special talents or interests in areas that aren’t being served at the high school level. If you want your voice to be heard, be sure you are not saying the SAME thing as every other college rep they hear from. Yes, all those facts about your school are important; class size, top majors, new buildings, etc., but your face time with the counselor needs to concentrate on things that can’t be read about in a handout or on your website. Are there specific college programs that would interest some of your students that you have had a hard time finding? Do you have a student with particular passion we might be able to help? How can I make your job easier? High school counselors enjoy hearing (and often sharing) stories of successful placements. When possible, update them on some of their former students who are now enjoying college life at your school. Offer specific examples of students from all walks of life who have flourished in their new college environment. Follow up and follow through. Showing your appreciation with a handwritten thank you note will make you memorable and is an opportunity to highlight the unique values of your college. Keep notes about specific areas of interest you have uncovered in your conversation and follow up via email with any relevant news. Involve department heads and key administrators in sending personal notes about new developments on campus. Many of those prospective students you will be working hard to recruit in the coming months may walk away thinking one thing: That you don’t really care. You’re at the outset of a new recruiting cycle and the relationships you build with prospective students and the excitement you generate about your school will be the basis for your success next Fall. Your work going forward is not simply to provide the information that prospective students and parents need. It’s to cultivate relationships. Meaningful relationships are built on shared beliefs and mutual reward. This is true whether the relationship involves two people, a person and a company or brand, or a prospective student and a college. For a relationship to begin and remain long-lasting both sides must see mutual benefit and feel as though the other side understands them and is sincerely committed to making a contribution to the relationship. The correlation of relationships to enrollment is HUGE! Students select and reject colleges on this basis. This is evident in how students rated their chosen college and their second choice college with regard to six factors that are fundamental to the building of the student/college relationship. We presented students with six statements and asked them whether each statement applies to their chosen college, their second choice college or neither. CLICK HERE to see the complete graph that shows the differential between the first choice and second choice colleges in all six areas. It’s significant. As you can see, the race isn’t lost by an inch-it’s lost by a mile. Just how effective are your efforts really? Admission teams work very hard to spread the word about their institution during college fairs and high school visits. They lay out the facts and features. Your office most certainly conducts great campus open-houses at which enthused, friendly, and eager staffers speak positively about the great things your school can do for students. You may also have a well-planned direct marketing and electronic recruitment strategy. All of this activity is good and necessary but how do you know which, or if any, of these activities are generating the level of excitement and emotional connection that makes students show up on campus day one? The only way to know is to take measurements throughout the recruiting process. You can do this by adding specific questions to your ongoing conversations with prospective students. Or by introducing feedback mechanisms to your electronic communications. The goal is to track and respond to “needle movement” on both the micro (student) level and macro (pool) level. We’ve put out some tools you can use now. Our series of Free Counselor Training Tutorials on our website and YouTube channel is aimed at making your counselors even better at their jobs. On our website you’ll find an ever growing list of admission counselor tutorials. Subscribe to our YouTube channel to get even more. There you’ll find tutorials, up-to-date market data, co-sponsored study reports and a wealth of actionable information to help you with your recruiting efforts. This video training series is based on our highly-successful Interactive Counselor Training Workshop that counselors tell us is transformative. We have included sessions covering high–impact topics from the popular workshops we conduct at college campuses across the country. The goal is to best serve the student by truly understanding what he or she needs and wants. Ultimately, that will make both you and the student more successful. If you’ve thought about helping your staff with professional development, now is the ideal time to train and motivate your staff. Email or call me if you are interested in how we can help. Continue the conversation on Twitter@LongmireCo. For more information about Longmire and Company and the tools we have to offer, click here. Be sure to subscribe to Versions of Conversion today. Wouldn’t it be great if you could take a peek into the minds of your pool of prospective students? Find out exactly what they really think about your school and how they compare your college to the others on their list? You would finally know what they are not telling you; the concerns and perceptions that impact their college decision that they are unwilling to share. It would sure make your job a lot easier, wouldn’t it? 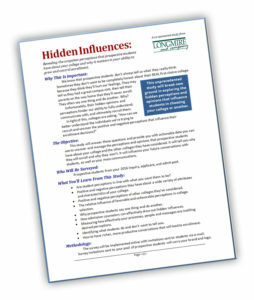 Our latest co-sponsored study, “Hidden Influences: Revealing the unspoken perceptions that prospective students have about your college and why it matters in your ability to grow and control enrollment,” is doing exactly that. We are taking a deep dive into uncovering the things students hold back from colleges during the college shopping process. 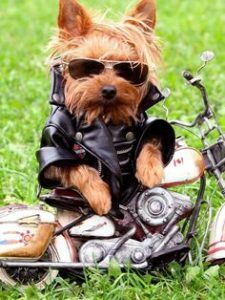 More importantly, we are discovering techniques and strategies colleges can use to unmask hidden influences and deal with them before the student solidifies his or her enrollment decision. Students may not be willing to share their hidden feelings with the colleges they are considering but they have been opening up to us. In volumes! We are so excited about what we are learning that we are going to give you a sneak preview of a few of the things we are uncovering. Keep in mind that we’re giving you high level, first-look findings at this point. Each co-sponsoring institution receives highly detailed data from their pool of prospective students that won’t be shared publicly. We are still in the early stages of capturing and analyzing data (as a matter of fact, colleges and universities are still jumping on board this study) but with over 10,000 student respondents to-date, there are some trends we want you to know about. Here are three critical insights of the dozens we are seeing. More than half of students tell us that while visiting a college campus they saw or experienced something that made them cross that school off their list. Students are very specific about these “game-changers” too. The list includes “lack of cleanliness,” “rude faculty,” “my counselor couldn’t answer my questions,” and “the tour guide was too flippant.” And that is just a small sampling. Patterns are emerging in the data that will enable colleges to react and fix the things needing attention. You may ask a prospective student, “Hey, what were your impressions of us after your visit?” Well, most students (by a large margin!) will freely share their positive impressions. A small (think very small!) 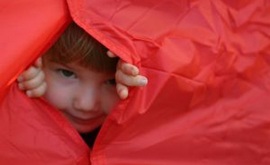 percentage of students will offer up their negative perceptions or unfavorable interactions. That’s not to say you can’t extract that from them with skill. You can. The study is capturing a variety of ways that this information can be easily uncovered. The “Hidden Influences” study is testing a number of strategies to uncover negative perceptions. Meanwhile, take note that very few students report ever being asked by a counselor if they saw or experienced anything negative during a campus visit. Yet, if asked in the right way, many tell us they are more than willing to talk about their negative perceptions and experiences. Opening the door with the proper approach is the required strategy. The national report will be available after we have shared the findings with co-sponsoring institutions. We’ll let you know when it’s available. But, as I mentioned earlier in this post, colleges are still jumping in as co-sponsors to get data from their Fall 2016 pool of prospective students. You should consider joining the group! As a co-sponsor you receive a far more in-depth personalized report that includes highly specific data for your college including comprehensive tabulations relating to your pool of students, as well comparative data of others in your cohort and other market segments. For instance, you will know what your prospective students found both attractive and unappealing about your specific campus and how they compared that to the other colleges they considered. You will know precisely what they did and did not like about the campus tour, the representatives they interacted with and how their perception of your college did or did not change. 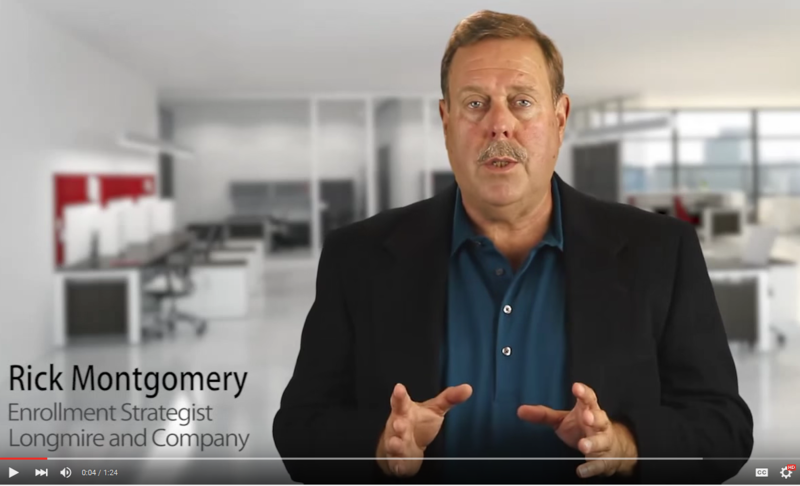 Longmire and Company Enrollment Strategists will present a fully customized webinar to you and your team to review your individual findings, along with recommendations for specific actions you can take to uncover hidden influences and have more effective conversations that will lead to enrollments. For more information or to reserve your participation in this study, contact me at (913) 492-1265, ext. 708 or by email at rmontgomery@longmire-co.com or Bob Longmire at (913) 492-1265, ext. 709, blongmire@longmire-co.com. Colleges are signing up now so we encourage you to contact us soon if you are thinking about participating. CLICK HERE FOR COMPLETE INFORMATION.